InSTEDD has been very happy to host the Flu Manual on our site for the past year or so. 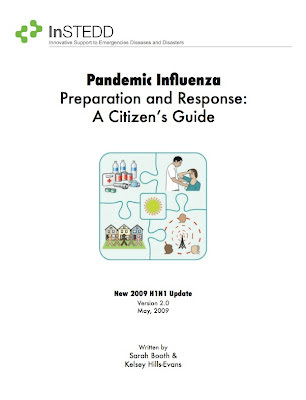 The manual, called "Pandemic Influenza Preparation and Response: A Citizen's Guide", is widely considered the best of its kind and has been reproduced in at least five languages across the globe. You can find it here. It's currently being distributed within NASA, the NFL, the Los Angeles Federal Executive Board (the largest in the nation), WebEOC, Verizon, and quite a few other locations that we're hearing about second-hand. There have been more than a thousand downloads of the Guide since the outbreak began last week and we're very pleased it's found such wide acceptance. Although this outbreak is an H1N1 variant from Mexico and not the H5N1 avian influenza from Asia that we've all been worried about for the past few years, it's still spreading very rapidly and it's killed quite a few people in Mexico. Fortunately, that level of lethality is not yet being seen elsewhere in the world but, from our point of view, preparation is easy and sensible and we should simply do it. It's good public health practice. The historical viewpoint you can gain from the Guide is particularly helpful. These first weeks have always been a very difficult period in an epidemic as public health staff try to sort out who, what, where, how much and all the rest. In my opinion, the World Health Organization response, as well as that of the US Center's for Disease Control in Atlanta, has been as thoughtful and as measured as anyone could hope for in the current communications age. The avalanche of information is very difficult to sort and verify, yet it's difficult to have systems in one place talk to systems in another place, and it's always really hard to get information from the developing world. The public health professionals who have not slept in much of a week have our admiration and our thanks. Although we publish it, the Guide is not an InSTEDD creation. 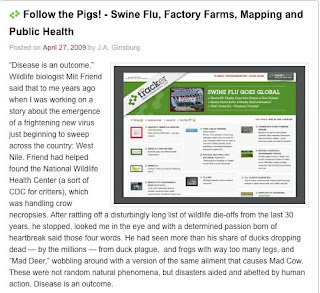 It was written by two Stanford University students, Sarah Booth and Kelsey Hills-Evans, with guidance on medical issues from several physicians including David Heymann, MD (then Assistant Director-General of the World Health Organization in Geneva), Professor Dennis Israelski (previously Director of the Fellowship Program in Infectious Diseases at Stanford University Medical Center) and Grattan Woodson, MD. The Guide is free and can be distributed to anyone without limitation. It's covered under a Creative Commons license and we encourage reproducing it anywhere and everywhere. At the moment, WHO has established Pandemic Level 5 (out of a possible 6), though the absolute numbers of patients and their level of illness appear to be realtively mild throughout much of the world. Patients associated with Mexico seem to have had a more severe clinical spectrum and we'll watch to see whether that greater severity appears anywhere else. Internally we're following the notifications on Twitter from Veratect (www.Twitter.com/Veratect) and reading the really exceptional work that Janet Ginsburg is doing on TrackerNews.net. 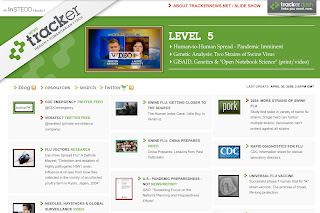 Don't miss her hair-curling blog on factory farms and their infectious disease risks at www.TrackerBlog.InSTEDD.org. It's an interesting time to be involved in outbreak response. We're doing quite a bit, but we've been asked to keep it private so we will. I'll mention though that, as for so many within the outbreak response community, there has not been much sleep within the InSTEDD team over the past week.